Heather Bell came to USC in January 2011. She is an Assistant Athletic Director and serves as the Director of Athletic Academic Advising. Heather’s primary responsibility is to serve as the lead administrator of the academic advising component of SAAS which includes supervision of the other 7 full-time advisors. She also oversees and coordinates all academic support for the Football and Men’s Basketball teams. As Director of Advising, Heather facilitates staff meetings, directs strategic planning, oversees APR submission, and manages the eligibility certification and files in SAAS. She also coordinates the guest coaches program for football and men’s basketball and the department’s summer aid applications and approvals. During her time at USC, in an advising capacity, she has also worked with the Women’s Basketball, Women’s Track/CC, Women’s Volleyball, and Lacrosse teams. In addition to her responsibilities as Director of Advising, Heather also serves as the secondary sport administrator for the Women’s Basketball team and is a member of the Athletics LGBTA and athletics culture committees. Prior to USC, Heather worked at the University of Tennessee in the Thornton Athletics Student Life Center as a Sr. Academic Counselor beginning in 2007. Her main responsibilities were advising the Football team (LB, DB, WR, DE), Technology Coordinator, and creating the Summer Bridge Program. 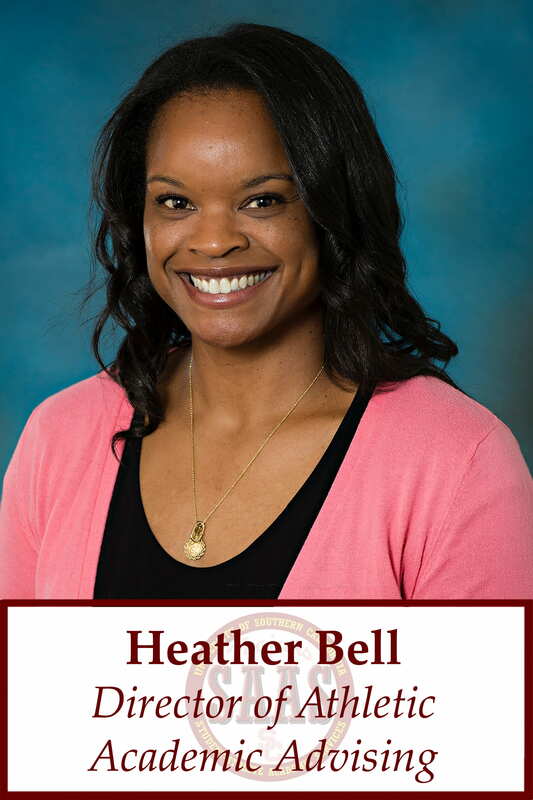 Heather began her time at Thornton as an Academic Mentor for football in 2006 while she was earning her Masters of Science in Sport Management. While pursuing her graduate degree she was also a Graduate Teaching Associate for the Physical Education Activity Program. Heather graduated from the University of Southern Mississippi in 2004 where she earned a Bachelor of Arts in Mass Communications. During her time at USM, she was a member of the Golden Eagle Softball team who made 2 NCAA Regional Appearances and won 2 Conference-USA titles. Born and raised in Southern California, Heather is an active member of the National Association of Academic Advisors for Athletics (N4A). She earned her N4A individual certification in 2013 and was awarded the N4A Region V Professional Promise award in that same year.